← I live in the Number One City for Beaver Like Mammals! You should ask WBLM radio in Portland, Maine to link to your site. The generally leave off the “W” when doing station identifications and just use “BLM”. 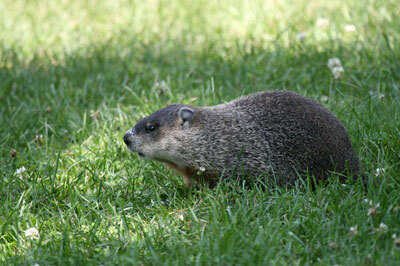 Anyway, my name is Skip and I saw this really tame groundhog in Fort Halifax park in Winslow ME on July 25, 2007. I was using a zoom lens, and was about 30 feet away from him. I was surprised to be able to get so close, since he would have had to cross about 100 feet of open lawn to get to some sort of cover. Here he is, at a life-threatening distance of about 30′ with no crop at 400mm. These guys are faster than greased lightning and can cover small distances like that in the blink of an eye, so I was pretty nervous. Luckily, he had fed well, and the desire to slash human throats was suppressed enough to allow this encounter with no direct confrontation. I stood my ground when he flashed his razor-sharp teeth and growled at me. I don’t expect to always be this lucky. Thanks Skip for the captivating story and great photos. Let’s hope this exciting sighting is a preview of things to come for BLM Season 2008.